Today’s FHA suffered from many of the same unrealistic underwriting assumptions that have done in so many lenders during the 2000s. It had also been harmed, like other lenders, by a housing market as bad as any seen since the Great Depression. As a result, the federal government announced in 2013 that the FHA would require the first bailout in its history. At the same time that it faced these financial challenges, the FHA has also come under attack for the poor execution of some of its policies to expand homeownership. Leading commentators have called for the federal government to stop employing the FHA to do anything other than provide liquidity to the low end of the mortgage market. These arguments rely on a couple of examples of programs that were clearly failures but they fail to address the FHA’s long history of undertaking comparable initiatives. This article takes the long view and demonstrates that the FHA has a history of successfully undertaking new homeownership programs. At the same time, the article identifies flaws in the FHA model that should be addressed in order to prevent them from occurring if the FHA were to undertake similar initiatives in the future. 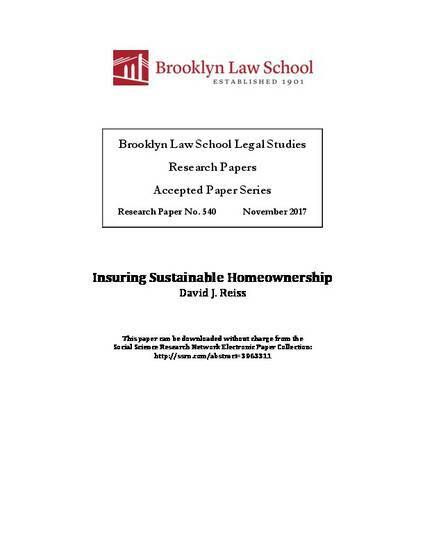 This short article is drawn from David Reiss, Underwriting Sustainable Homeownership: The Federal Housing Administration and The Low Down Payment Loan, 50 GA. L. REV. 1019 (2016).